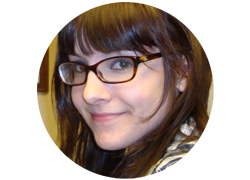 I’m very excited to introduce Freya, the creative mind behind Gilded Creatures, creator of beautiful soft sculptures, pins, and matchbook dioramas. I’ve wanted to interview another artist for some time and her work definitely spoke to me. 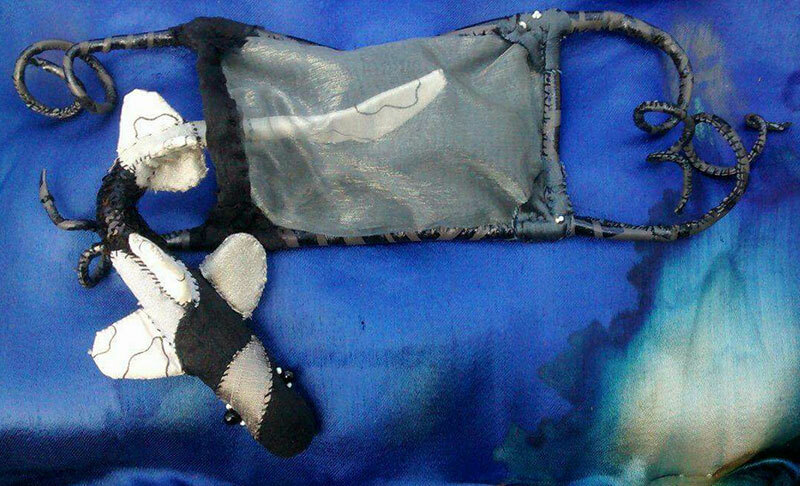 What drew me initially was her subject matter: mermaids, bats, and insects (I believe I was searching for praying mantis paraphernalia on Etsy when I initially found her work) and use of sumptuous silk (dupioni is one of my favorite materials) with tiny stitches. 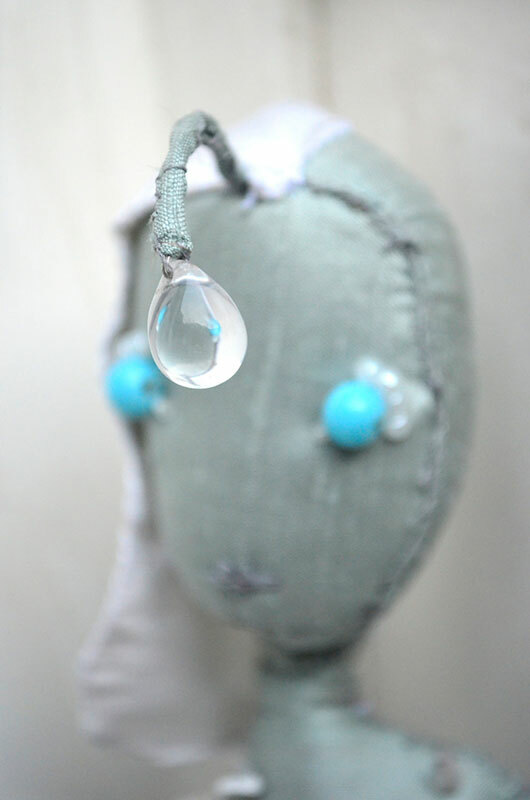 As I looked closer I saw her clever use of found objects in a few of her pieces. The little bit of sea glass that becomes an egg in her shark diorama. 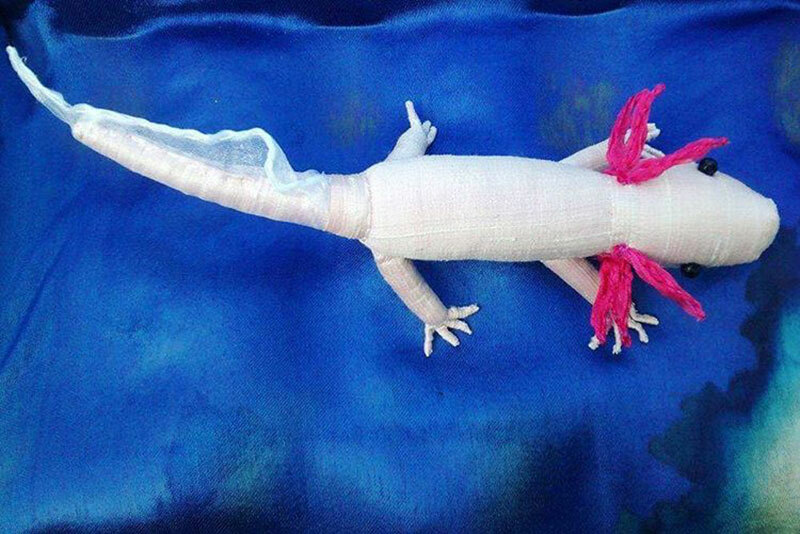 I remember finding a “mermaid’s purse” on the beach when I was little and being quite disappointed that I couldn’t bring it home and raise an army of baby sharks. 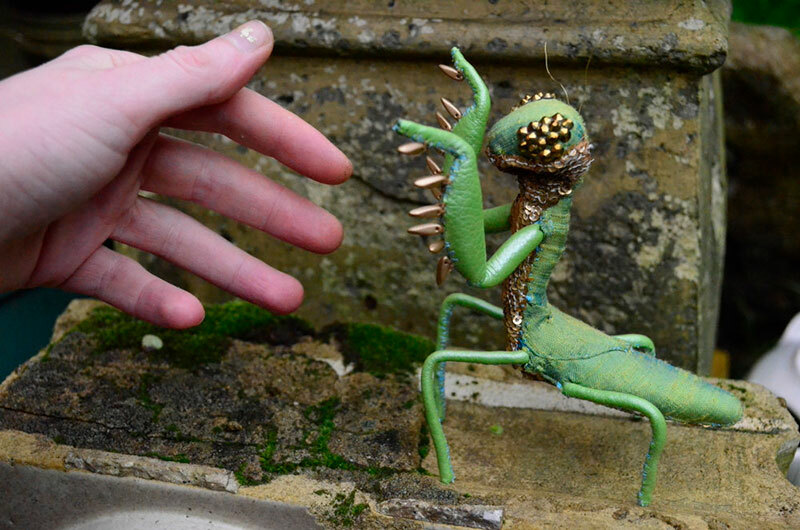 Her matchbook dioramas feature tiny polymer clay creatures coupled with bits of fauna to make them feel right at home. 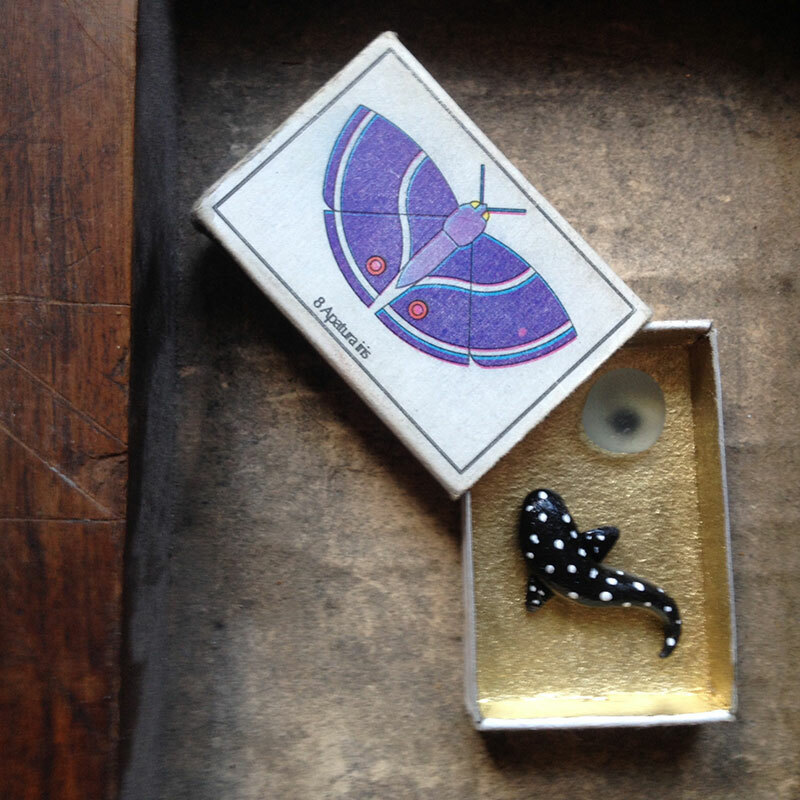 I was a very artsy child, I remember making tiny animals out of baby bell wax and taking them to bed and having them melt all over my Gran’s white pillows! And making comics and books. I always had a very vivid imagination and loved to make up my own worlds with lots of characters. I was always encouraged and supported by my parents, my dad carved us toys out of wood and my mum made quilts and tapestry. 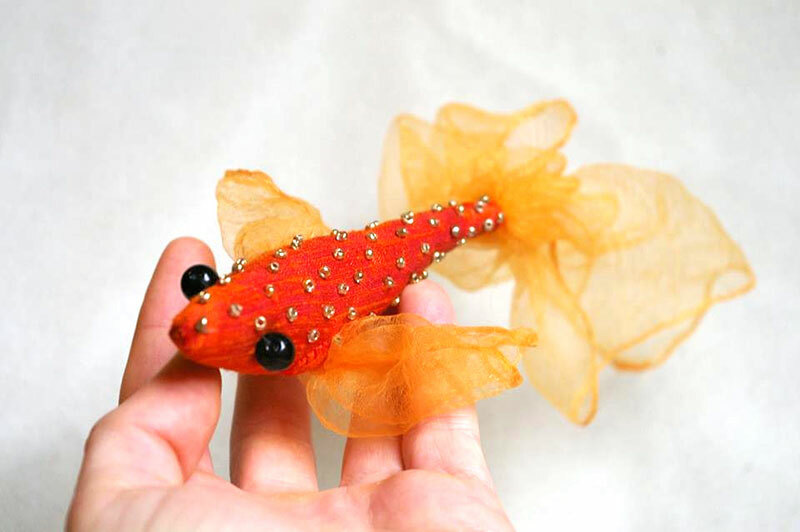 Almost everything I make is inspired by the natural world, mainly animals, insects and fish. My favorites are cats and sharks, but also pretty much every animal apart from mosquitos. Sorry mosquitos! Regarding your use of materials, what happens first: do you dream of your project and then search for materials or do you find a material and the material inspires you to create? For example, Michelangelo would see a block of marble and imagine a sculpture. He said that his sculptures already existed in the large blocks of marble, he just needed to carve and extract them. I tend to stumble across a material and go crazy and spend all my money, make things for a few months very intensely, then find the next thing. But I keep everything and usually I’ll come full circle with new ideas for the medium. I feel like most of my ideas are slowly growing in my subconscious and then it’ll bob above the surface and I’ll feel inspired. If I consciously try to have an idea I can hear the crickets chirping. Since my first experience with polymer clay as a child to now it’s been a favourite. I like that it’s so versatile, I have used it in matchbox art, fabric sculptures, jewellery, collage and by itself. Dupioni silk is gorgeous but felt is the unsung hero of my softsculptures. Currently obsessed with enamel pins but I miss not controlling the entire process of creating. That’s a very hard question! I tend to be quite hard on myself and see all the flaws in my own work. Like most creative people I’m sure! I do love my mermaid sculptures, especially the deep sea mermaid with the light lure, and finally finishing my baby shark and eggcase after over a year felt very good. 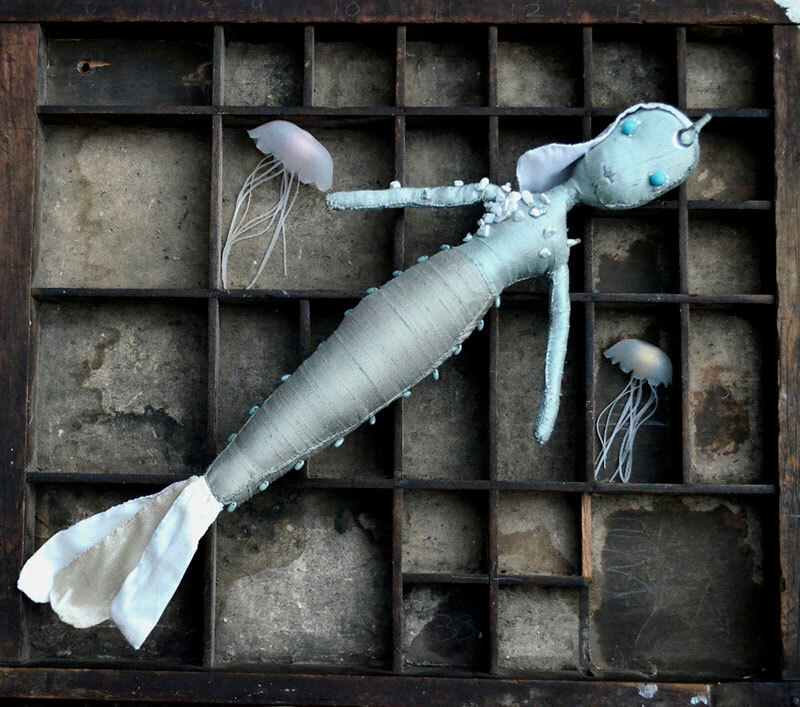 This clever mermaid has taken a page from the Anglerfish’s book. Why hunt for food when you can have food come directly to you? How does your creative process work? Some people will sketch while others will dive right in. I have a hard time trying to hold back and plan rather than just diving right in haha. Do you make drafts before working on your “final copy”? I always buy a nice notepad for ideas and then end up doodling on receipts, envelopes, anything I can grab at the time of an idea. I’ve drawn things in eyeliner before so I don’t forget it! 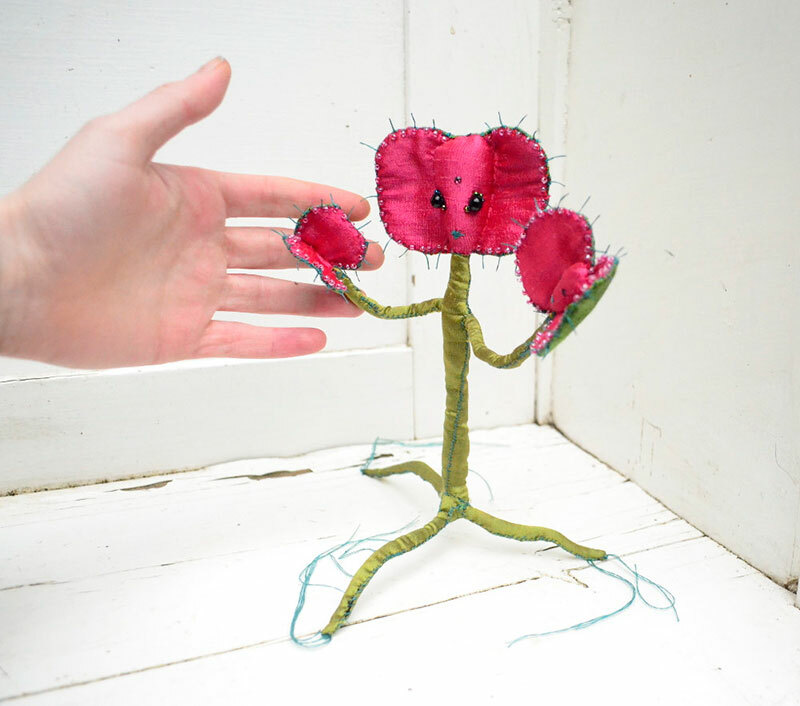 The process for a fabric sculpture is usually without any sketching, I form a basic shape from felt and an armature if needed and then refine it as if with clay. I tend to try things in my own way and then realise everyone else makes it a lot easier for themselves. I don’t have a computer at the moment so most of my pin designs are done on my phone using a sketch app, tracing a photo of my drawing and editing if needed. 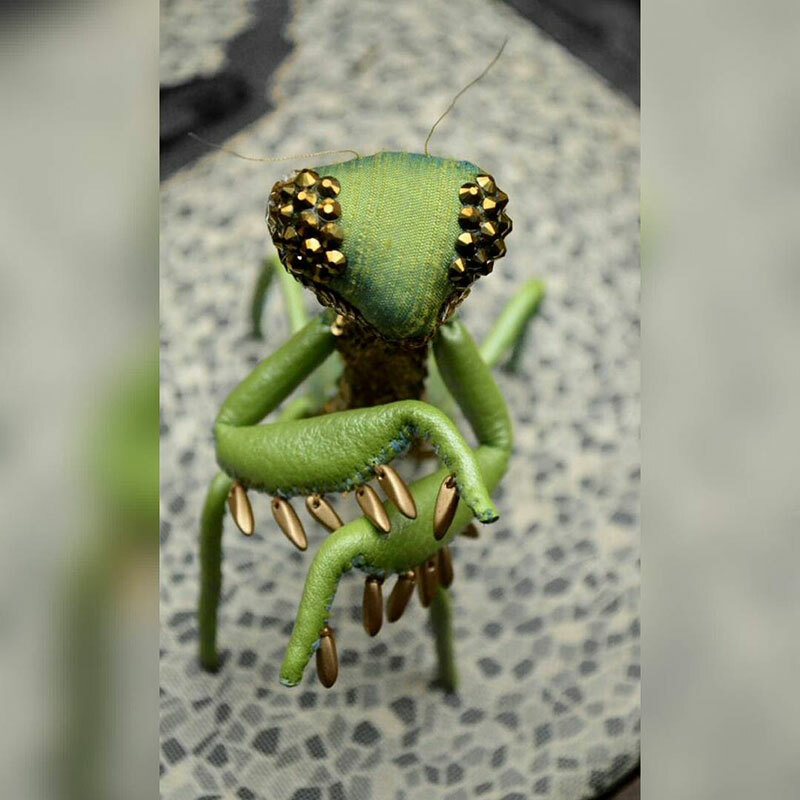 Dupioni silk venus fly trap soft sculpture. 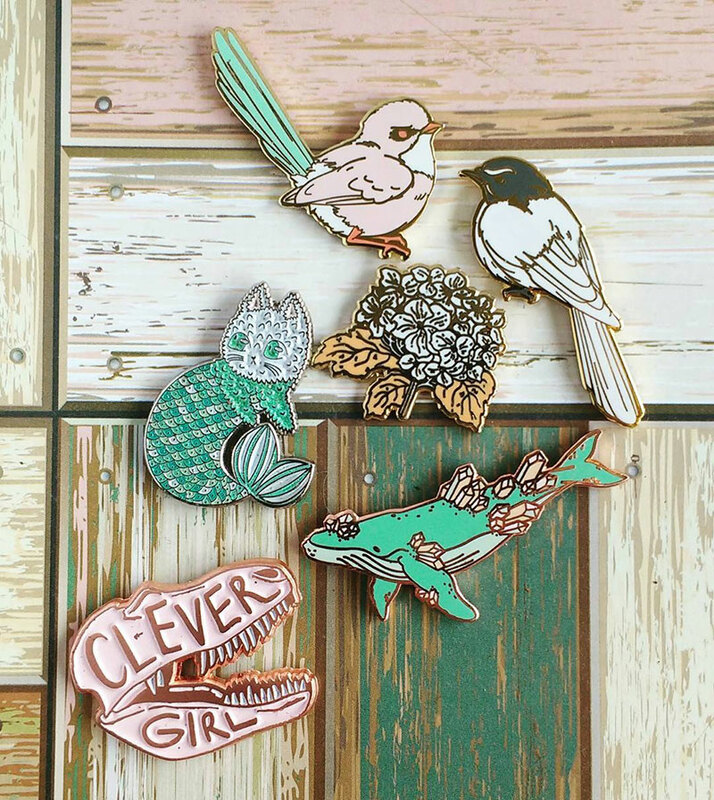 What are some of your favorite enamel pins in your collection? 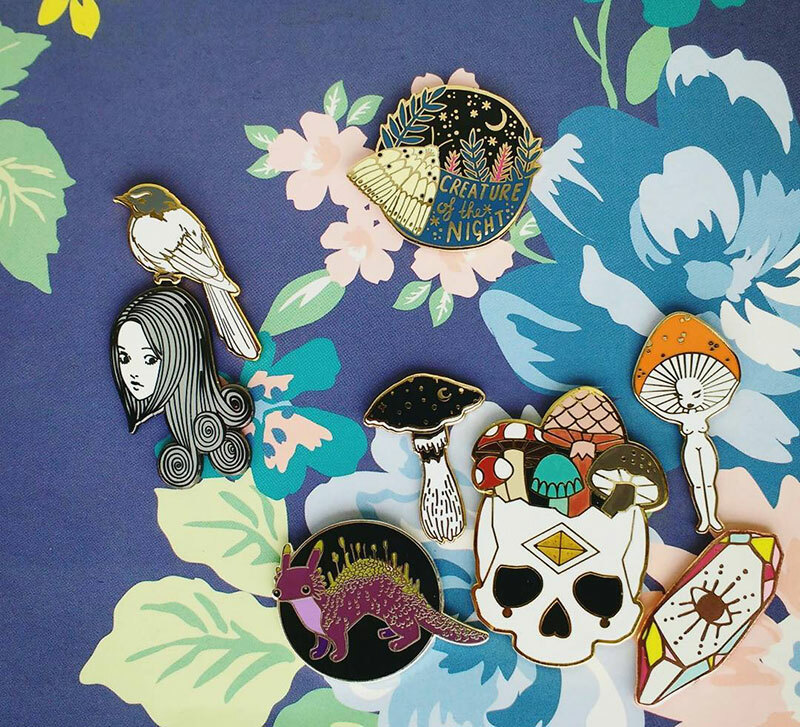 I love your mushroom girl pin, are you planning more pins for the future? 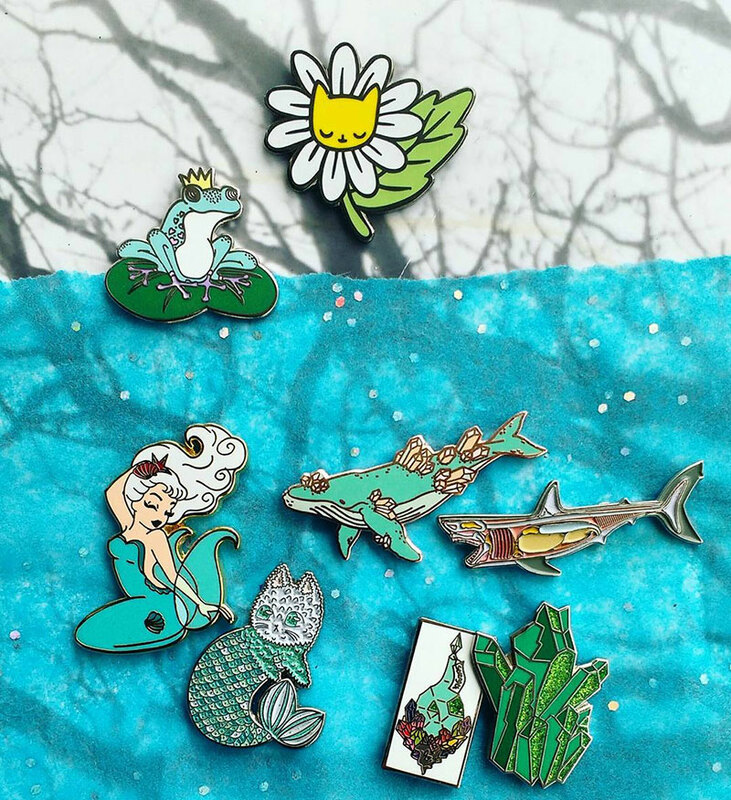 My favourite pins are the ones yet to be made, haha. I love seeing my art transformed into metal and colour, but I am most pleased with how the mushroom girl and my cat vase pins look. Hard enamel is my personal preference. The cat vase is on its way soon! I have many ideas for pins, and lots of finished designs, the difficult part is deciding what order to make them in. 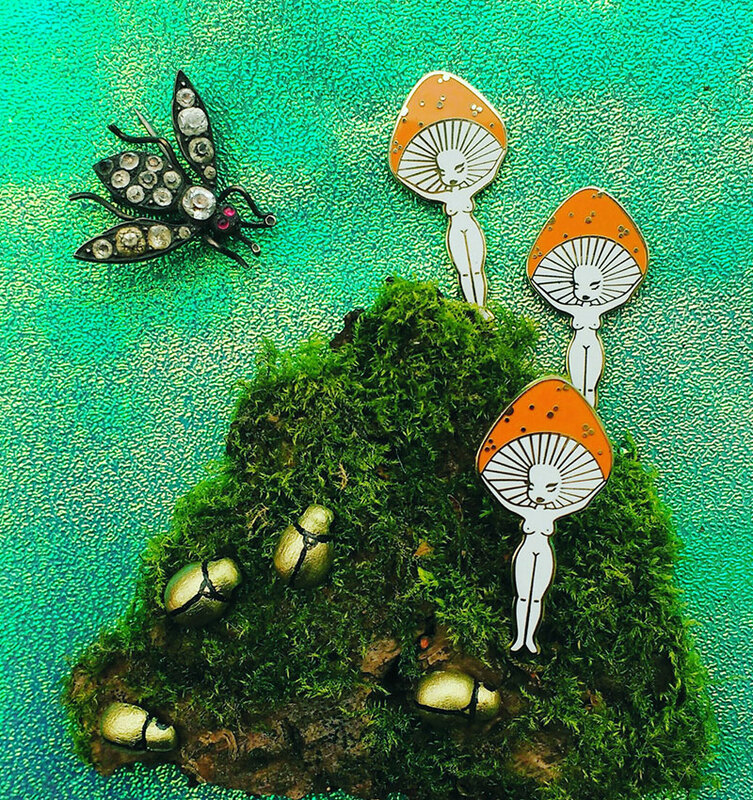 Freya’s mushroom girl enamel pins with tiny polymer clay beetles. 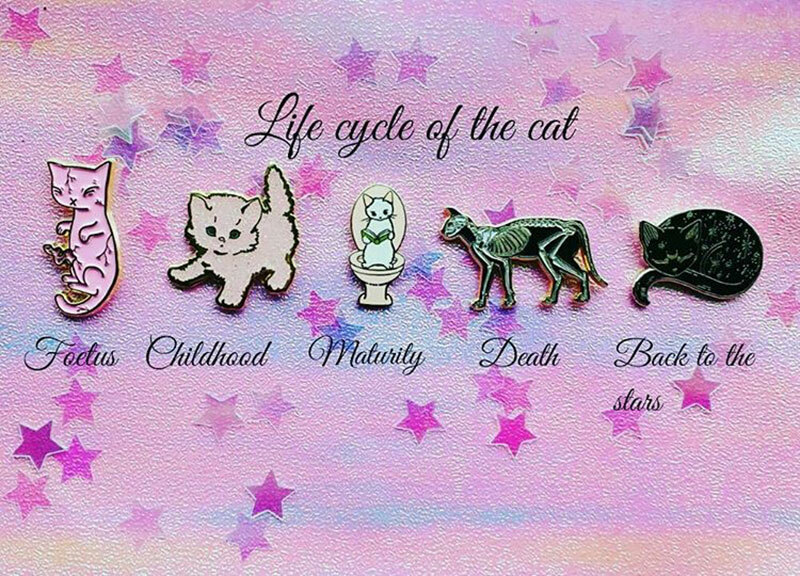 Her tiny cat embryo pin alongside some of her beautifully curated pin collection by other independent artists. More of her pin collection, via her Instagram.